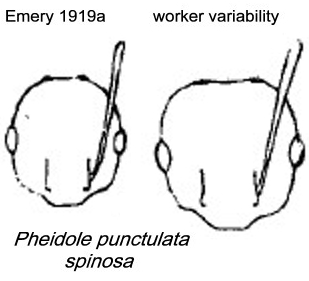 I agree with Dalla Torre (1893: 95) and Emery (1915j: 235) that Pheidole talpa (Pheidole talpa n. sp., Gerstäcker, 1871: 356, major; Santschi, 1930b: 67, minor & queen) from Tanzania, Mbaramu, Decken, is a junior synonym of punctulata and not of megacephala as thought by Santschi (1925h: 160) and listed in Bolton (1995: 331) - note specially the rhomboid pronotum with acute angles - see http://www.antweb.org/specimenImages.do?code=casent0906522. Mayr's (1866b) description is at . Arnold's (1920a) fuller description is at , and . 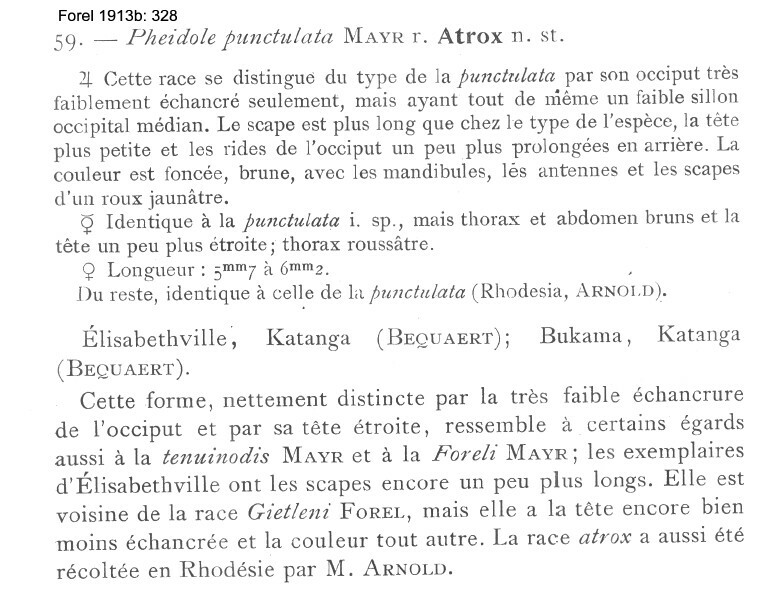 Forel's (1913b) description of atrox is at . Arnold's (1920a) translation of atrox is at . Forel's (1914d) description of inquilina is at . Gerstäcker's (1871) description of talpa is at . Emery's (1915j) revisionary notes are at . Santschi's (1930d) description of atrox is at . Santschi's (1937g) description of atrox is at . Santschi's (1937g) description of subatrox is at . 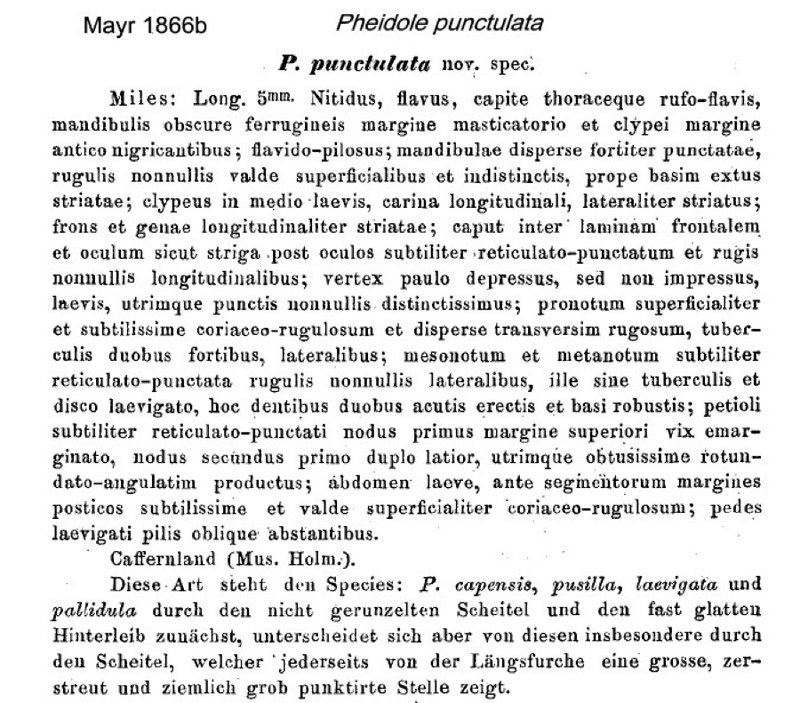 "I was able to restudy the original specimen of Pheidole punctulata, which I described in the year 1866, due to the friendly willingness of Mr. Professor Chr. Aurivillius, with the conclusion that Professor Forel was right as rain to recognize this form as a variety of Pheidole megacephala Fabr. 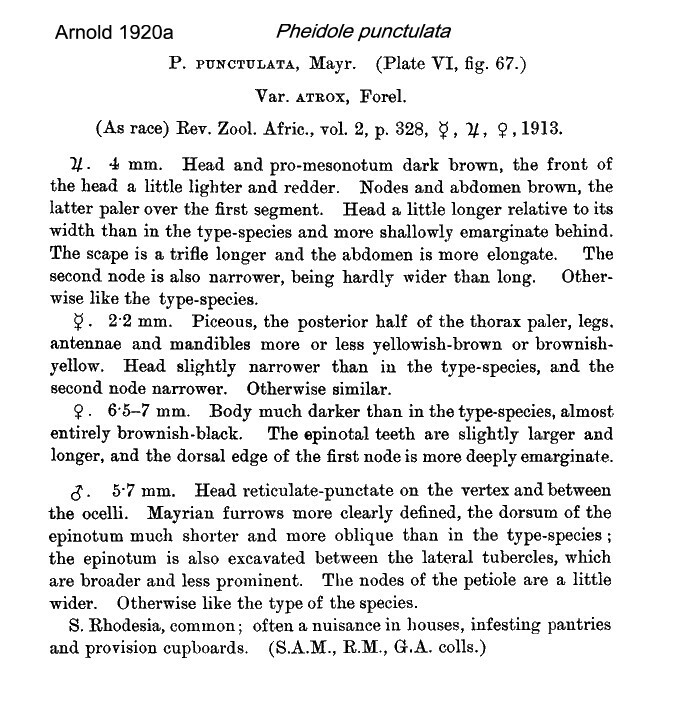 (In contrast) I do not agree with Forel’s opinion, that Pheidole rotundata Forel might be just an extreme form of Pheidole punctulata, because the rounded-quadratic head, the hind frontal carinae strongly directed outwards, the strongly curved forehead and the strongly curved posterior part of the mesonotum down-sloping nearly vertical in front of the meso-metanotal suture are opposite to his opinion." 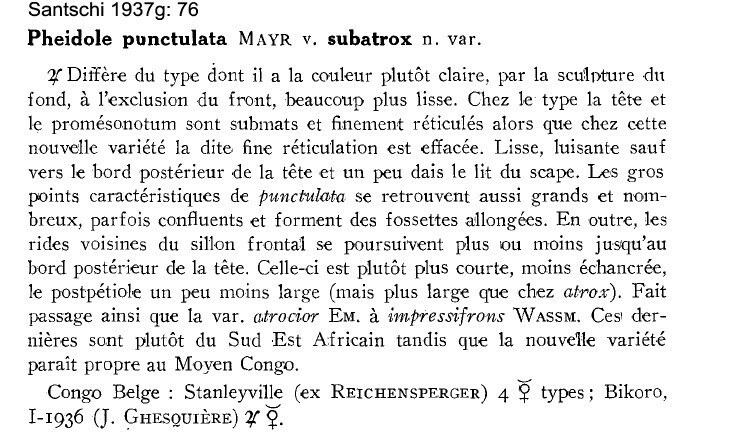 Listed also by Wheeler (1922) from Guinea (Mamou, F. Silvestri), Ivory Coast (Assinie, C. Alluaud) and Congo (Ogowe, Mocquerys). He described it (as a ssp of megacephala) as a well-known and widely distributed Ethiopian form, apparently more abundant in Zaïre than the "typical" form of megacephala. Nesting sites were in damp situations, such as under heaps of decomposed moist grass. 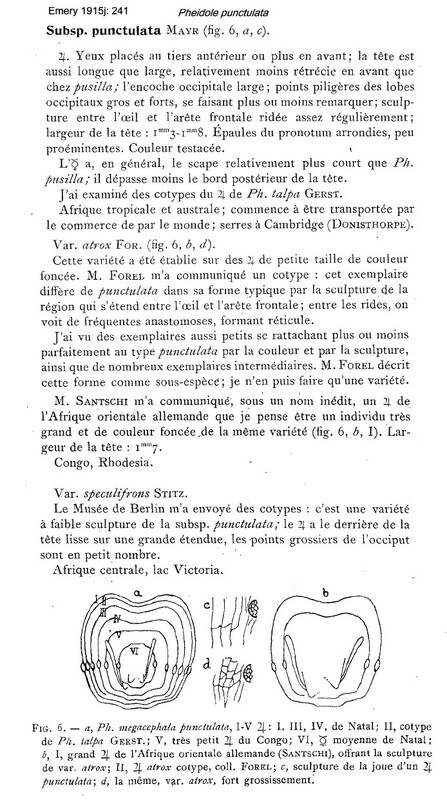 Forel (1909b) listed a number of findings from the Congo Basin, South Africa and Zanzibar. He noted that in Benguela they were a pest everywhere. 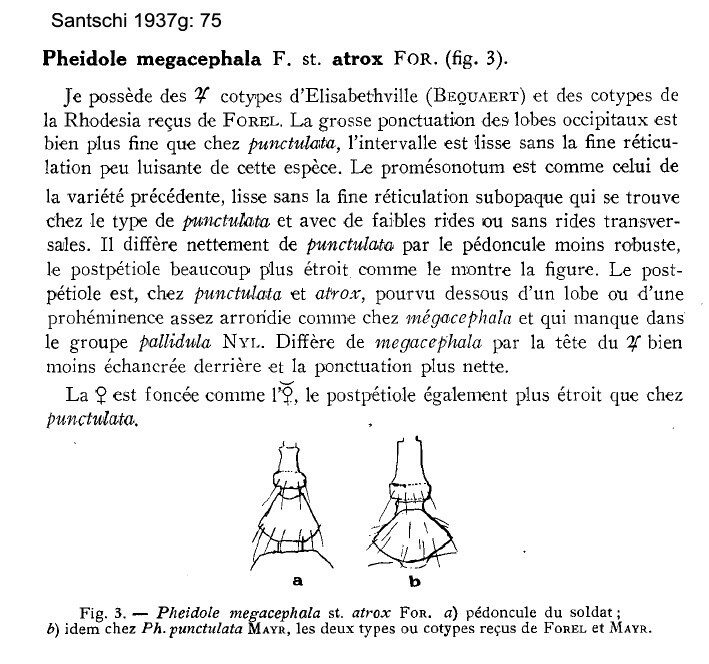 Santschi (1935) identified atrox majors and minors from Luluaborg, Zaïre, which were with coccids - "ants living at the foot of herbs and trees on which were living Coccids, notably a species shaped like a Bishop's mitre"; some were collected feeding on a cow's heart (? "coeur du boeuf"). 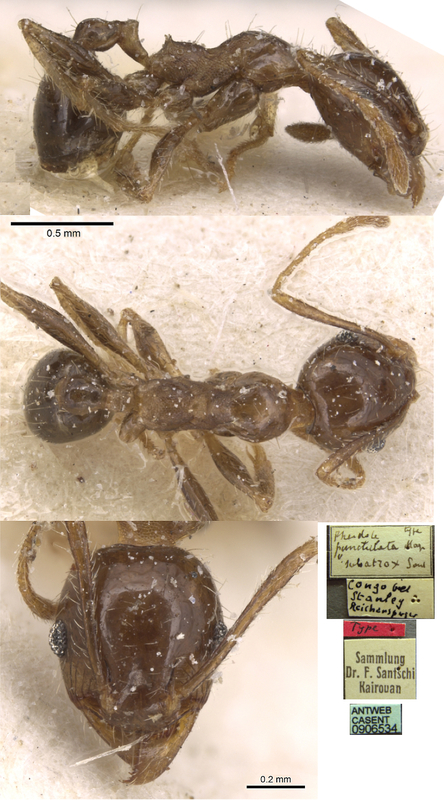 The photomontage of a syntype major worker is collated from http://www.antweb.org/specimen.do?name=casent0901316. 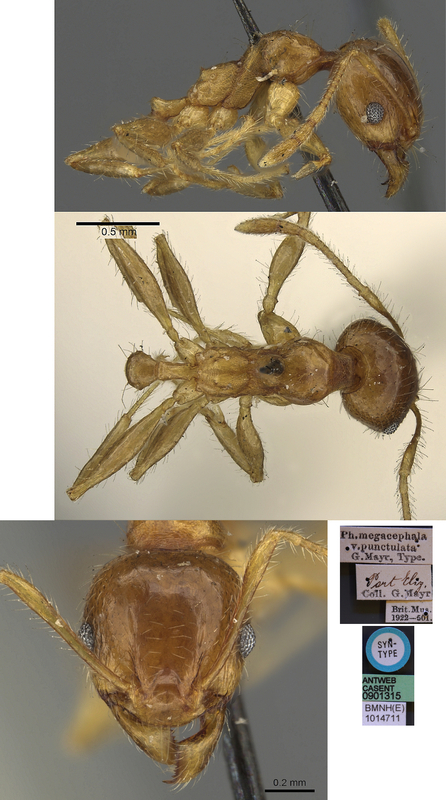 The photomontage of a syntype minor worker is collated from http://www.antweb.org/specimen.do?name=casent0901315. 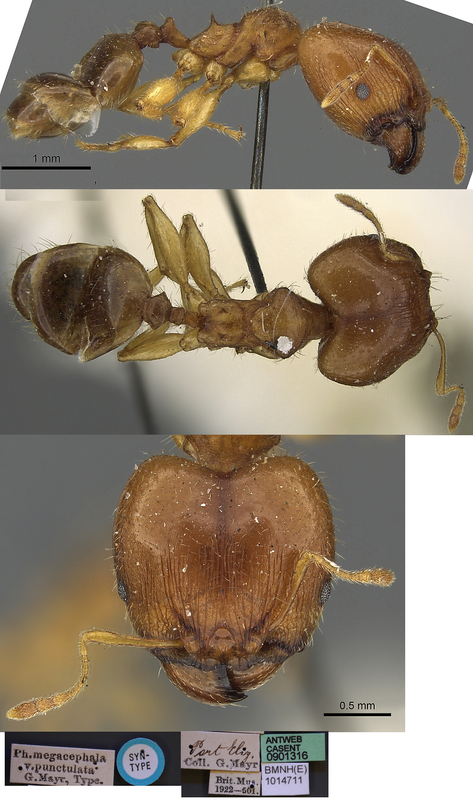 The photomontage of a subatrox minor worker is collated from http://www.antweb.org/specimen.do?name=casent0906534. Major - the photomontage is of specimens from Kwazulu, Natal, South Africa, Dragensberge (Injiauti NP), S 29°07.7' E 29°25.3'; 1500 m; 6.ii.2004; Peter Hlavác; several majors and minors. These closely match the original descriptions and, so, I have removed what I earlier had listed as crassinoda to a separate status. 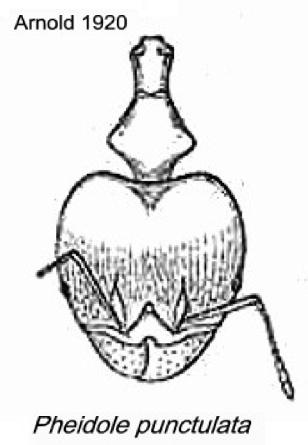 The arrangement and size of the hypostomal teeth place this close to Pheidole megacephala. With the Antweb images shown above (accessed October 2012) this is confirmed as the type form major, as is the minor below.